At a time when the world is experiencing the highest levels of displacement on record, it is of upmost importance to look for solutions that foster empathy, capacity development, and empowerment. According to the most recent numbers gathered by the UN Refugee Agency, 65.6 million people around the world have been forced from their homes. Among them, 22.5 million are living as refugees and over half of these refugees are under the age of 18. Against a background of multiple, simultaneous, protracted, and escalating conflicts, we are facing an immense need to foster an empathic global community that exercises compassionate leadership. This community must begin at the earliest stages of a child’s life. In 2013, iACT developed Little Ripples, an early childhood education model designed to holistically address childhood care, development, and education of refugee children. Little Ripples recruits, trains, and employs refugee women to adapt, implement, and scale Little Ripples programs in their communities to improve the social-emotional, cognitive, and physical development of young children. Empowering refugees from the outset ensures that the Little Ripples' design and curricula are culturally relevant, foster ownership from the outset, and enable the program’s longevity. Ownership of education is further encouraged by hosting Little Ripples in the refugees’ home spaces. In refugee camps, simple but colorful structures are built to create safe learning spaces for both teachers and students, reducing the upfront costs of constructing and establishing schools and instead investing more resources into teacher training and local capacity-building. A student attending a Little Ripples center need only to walk a short distance to a neighbor’s house, where two female teachers host a program for 45 children. The Little Ripples curriculum is a pre-established framework of evidence-based, early childhood education developed by experts that can be adapted to any context. This framework guides refugee early childhood education teachers—at any level of education and experience—in play-based learning, fostering social-emotional development and peacebuilding, and using non-violent, positive behavior management and mindfulness. The refugee teachers adapt and complete the framework using activities, stories, and games unique to their respective cultures. 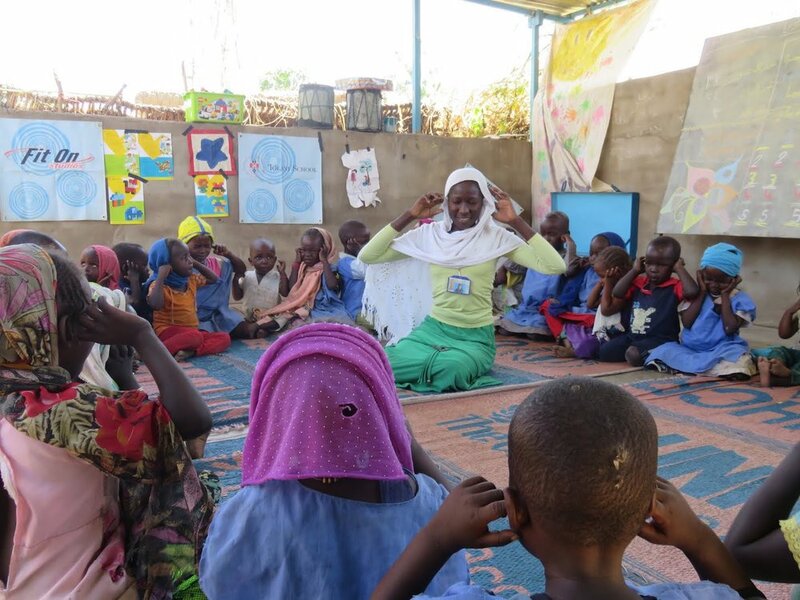 For example, Darfuris traditionally use drums for music and dance; therefore, the Darfuri refugee Little Ripples teachers in eastern Chad refugee camps incorporate the use of drums to guide children through mindfulness exercises. In all contexts, while each Little Ripples center is equipped with children’s books, Little Ripples teachers also share their own childhood stories as well as create new ones with their students during daily story time. With the means for cultural relevancy built into the Little Ripples structure, individual teachers are given the ability to customize the curriculum, allowing for variations from population to population and even between learning centers. However, the impact of the program does not occur in silos. To build a global community in which refugees and non-refugees are united in their work toward a more peaceful world, iACT connects Little Ripples students and teachers with their peers in other refugee camps and sites, and around the world, through another innovative program called Global Citizens. Students participate in the Global Citizens curriculum in Los Angeles, California. Through empathy-based and developmentally appropriate tools, activities, and resources that meet nationally recognized learning foundations, preschool- and kindergarten-age “global citizens” connect with refugee peers, explore identity and community, and practice empathic learning. The curriculum culminates in an action-based and community-oriented project that guides students in formulating a charter by which they can live happily and peacefully alongside their new refugee friends. These are the first steps along the path to global ambassadorship for many participants. Global citizenship by fostering relationships across borders in even the youngest members of our communities. Committing to these SDGs means contributing to building a peaceful future. Based upon the belief that education is key to driving sustainable development and fostering international peacebuilding, Little Ripples and Global Citizens focus on cultivating a culture of peace and empathy, while empowering the most vulnerable and least developed. Little Ripples seeks to break the cycle of violence endemic to refugee communities by helping these communities build a more sustainable and peaceful future by restoring dignity, developing resilience, nurturing an environment of mutual respect, and building capacity. Global Citizens is a historic experience that plants the seeds of compassion while fostering connections and meaningful learning opportunities for children that will last a lifetime, shaping the next generation of leaders. Both programs will lead to a more sustainable, peaceful, and compassionate world. We are seeking narrative, conversational-style articles that stay focused on a personal story of childhood, while connected to a global issue concerning childhood and children's education. If you have a story to share, please send an inquiry using the form below.